Since 1980 SAG Stampi has been a sub-contractor in the sector of NC turning and milling, notably in the machining of mechanical parts for the food and mechanical industries. Precision and quality of our products is guaranteed thanks to the use of instruments regularly checked and periodically calibrated. The tool paths for the NC machine tools are created and optimized through solid modelling and 2D import of the customers’ drawings which are then processed by 3D CAM software. Since 1980 SAG Stampi has been a sub-contractor in the sector of NC turning and milling, notably in the machining of mechanical parts for the food and mechanical industries. We machine finished parts to the customer’s drawing and follow all manufacturing steps, from the purchase of raw materials to turning, milling, grinding and broaching. We can also provide thermal treatments or other types of surface coatings on customer’s demand. Over time we have acquired an excellent reputation as to reliability and quality of our products and we can avail ourselves of state-of-the art machine tools and equipment constantly upgraded. 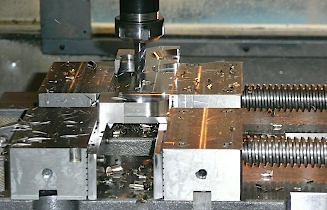 Milling is carried out by means of last generation tools which together with the experience and know-how of our operators allow us to reach high quality standards. 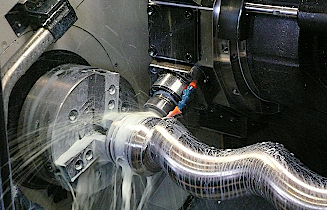 The several types of NC lathes available allow us to carry out both second operation and bar machining for small and medium runs or for mass production respectively. The whole workshop is indeed equipped with modern NC lathes fitted with motorized turrets, sub-spindle and automatic bar feeders. 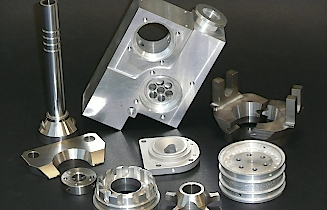 Parts are machined to the customer’s drawing by means of NC lathes with motorized turrets and 3- to 5-axis continuous machining centres. Production is planned according to the availability of every resource (raw materials, machine tools, operators) in order to satisfy customer’s needs and delivery dates. Cod. Fisc., Part. I.V.A. e Reg. Imp. PR 00733860340 | R.E.A. PR 142396 - Iscr. Albo Artigiani 40615 Capitale Sociale: 20.000,00 euro i.v.